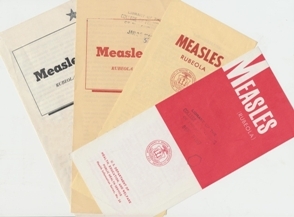 The New York Times has reported that cases of measles in the US has quadrupled from 2010 to 2011. Though it was large increase, it is still rare with only 222 cases throughout the United States spread across 17 outbreaks. However, since the disease is so contagious, an outbreak can develop and grow quite quickly. The disease is much more frequent in Europe, the New York Times reported, and many of the outbreaks were traced to foreign visitors or Americans returning from trips, typically Europe. The virus then spreads to children who have not received vaccinations against the highly contagious disease. As we have discussed, measles can be a dangerous disease. One-third of all U.S. measles cases required hospitalization. Although most children who contract measles survive the disease, the prognosis includes severe complications including death from panencephalitis. Also infected children, even if they have no serious complications, can infect someone who is immune-compromised. In that case, the consequences could be deadly. via U.S. measles cases quadrupled in 2011 | Vaccine News Daily.